The Brooklyn Gypsies are a Global Fusion group of musicians/ producers based out of NYC & Europe whose creative influences draw from a constantly shifting socio-political urban landscape while retaining their unique cultural backgrounds. The use of the term “gypsies” acknowledges the diverse international origins among the members & an urban nomadic nature of survival and expression within a city such as New York. Originating from Spain, Japan, Hungary, Italy & U.S.A. BK Gypsies truly represents Brooklyn’s diverse ethnic heritage and style. The gypsies came to be in 2012 within the Brooklyn Studio BPM music scene. Members include: Carmen Estevez, Troy “Mobius” Simms, Takuya Nakamura, Brandon Lewis, Zeb “The Spy From Cairo” & Fatima Gozlan. After a number of collaborative projects between the artist were explored the opportunity to form a band that incorporated elements from each project arose. 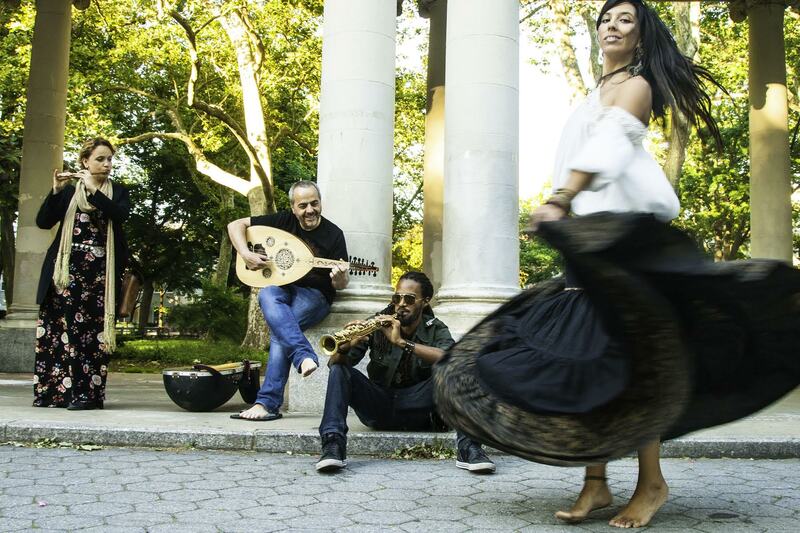 A BK Gypsies live performance is a sonic/ visual journey through the deserts of the Middle east, Morocco and Andalucia Spain emerging into the dancehalls of Jamaica and Brooklyn NYC. Tracks off their debut album “Sin Fronteras” as well as new material off an upcoming EP are showcased featuring live vocals, tribal fusion bellydancers, bassy electronic synths, arabic percussion, Oud & brass horns. “Sin Fronteras means without borders in Spanish and is a message we strongly believe in especially considering the current times we are living.” Just coming off a South East Asia Tour headlining at Bali Spirit Fest and playing events such as Ozora Fest in Hungary and Symbiosis Gathering in California has allowed the group to gain international notoriety within the global fusion genre in just over a year. Brooklyn Gypsies is a tribute and celebration of the nomadic gypsy spirit worldwide.